Last year, during my Erasmus year in Seville, one of the greatest experiences was that I could participate in the Solar Decathlon 2010 competition. I joined to the project in the second year, and had the opportunity to take part in the designing tasks, and also at the construction and exhibition in Madrid. Even then the idea was born: on the next competition in 2012, BUTE would like to represent Hungary in Madrid. The story would worth a longer entry, until that, read my dear friend, Té?s story, who spent a few days with me in Madrid. On summer of 2010, after the exam period, I went on a two and a half weeks of study trip with two fellows. Our first destination was Madrid. Two days before the flight, we didn?t know where to stay, but then came an e-mail from my Erasmus mate, he said, he could accommodate us. This was a huge relief, and it has started a chain of events, that worth everything. 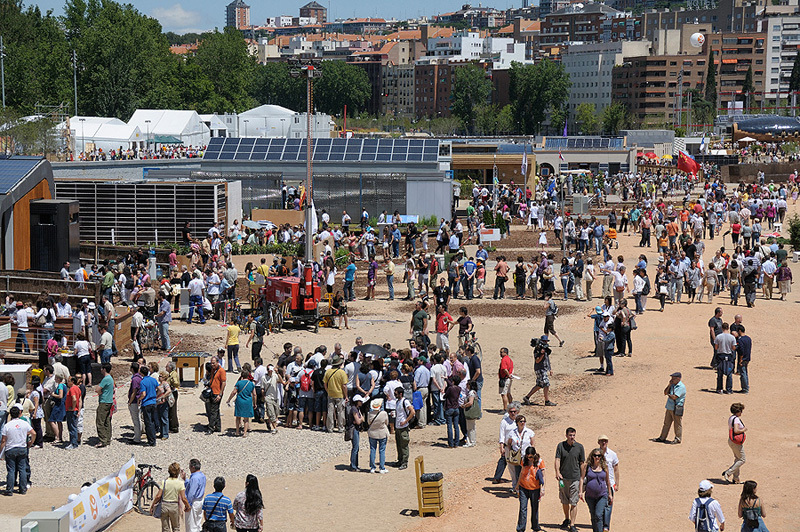 We got into the students of Faculty of Architecture in Seville, who took part in the final of Solar Decathlon. As an architect student, it?s a professional interest that we saw innovative, solar-powered houses, and it would have been enough; but that it is the result of student collaboration ? knowing the Hungarian universities? mentality ? it was really rousing. With the help of teachers, not only architects, but construction designers, mechanical engineers, economists and other professionals build an energy-efficient, next-generation technologies applied, human-scale houses. These houses battle for the first place in several different categories (it?s a decathlon so 10 criteria), from both technological and aesthetic point of view. In Hungary during our studies we hear a lot about adaptation to the environment and humility. By comparison it was really interesting seeing this small buildings next to each other, it represented an entirely different spirit, while we visited every houses in the heat of Madrid. So it?s also an alternative way to establish high-quality architecture. But not this was the main thing for us, because we know that from biennials, but seeing the student?s alliance to create small, complex and mostly likeable buildings was really amusing. As a result of these days, we talked about what is the message, what we can learn from all of this experience: it?s incredibly diverse and thoughtful. The fact, that every building from the very first sketch until the last screw is work of students; it?s a kind of experience, which every participant can be proud of. Team co-production is exemplary, if we take into count that the Hungarian education system is individualistic, mostly all people keep their own work for themselves; and students from different faculties work together is even rarer. But like any other exhibition, expo and brainstorming event, the goal is not to create the perfect and flawless building; ? we have never seen the prototype of cars on street either- , the goal is to find new solutions, use up innovations and follow the spirituality of the event. It?s a kind of thinking, that in a small cleverly designed building we can create a pleasant, technically fully equipped home, moreover in some cases produces the fuel for our vehicles (electric cars, scooters). We are able to trace and control the entire life of our house with the help of a hand-sized display, and our windows can be translucent or opaque as a result of a touch on this display. Trivial things like do not let the water run while brushing your teeth, don?t forget to turn off the lights and other trifles wasn?t written in the booklets, because this is the minimum we can do for our environment and these buildings also can be partners in the above mentioned things. Or maybe it?s just the fiction of my mind, but I?m insisting on these things. All in all, we could talk about the buildings one-by-one, maybe later I will do it, but the experience of these 3 days, the variety of buildings, and the never-seen-before solutions are much more important, and for the thousand times, the way of thinking, that we need to follow, because it means the future.